Love the briny tang of marinated artichokes? 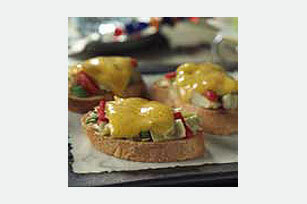 Then you'll love these delish appetizers featuring artichokes, roasted red pepper and cheddar. Place toast slices on baking sheet; top with remaining ingredients. Broil, 6 inches from heat, 2 to 3 min. or until cheese begins to melt. Substitute 32 RITZ Crackers for the toasted French bread slices and/or KRAFT Extra Sharp Cheddar Cheese for the CRACKER BARREL Cheese. Garnish with additional sliced roasted red peppers and green onions.